This page details the Player settings specific to standalone platforms (Mac OSX, Windows and Linux). For a description of the general Player settings, see Player Settings. Enable the Override for Standalone setting to assign a custom icon for your standalone game. You can upload different sizes of the icon to fit each of the squares provided. Use the Resolution and Presentation section to customize aspects of the screen’s appearance in the Resolution and Standalone Player Options sections. This section allows you to customize the screen mode and default size. Fullscreen Mode Choose the full-screen mode. This defines the default window mode at startup. Fullscreen Window Set your app window to the full-screen native resolution of the display. Unity renders app content at the resolution set by script (or by user selection when the built application launches), but scales it to fill the window. When scaling, Unity adds black bars to the rendered output to match the aspect ratio chosen in the Player settings, so that the content isn’t stretched. This process is called letterboxing. Exclusive Fullscreen (Windows only) Set your app to maintain sole full-screen use of a display. Unlike Fullscreen Window, this mode changes the OS resolution of the display to match the app’s chosen resolution. This option is only supported on Windows; on other platforms, the setting falls back to Fullscreen Window. Maximized Window (Mac only) Set the app window to the operating system’s definition of “maximized”. On macOS, this means a full-screen window with an auto-hidden menu bar and dock. This option is only supported on macOS; on other platforms, the setting falls back to Fullscreen Window. Windowed Set your app to a standard, non-full-screen, movable window, the size of which is dependent on the app resolution. In this mode, the window is resizable by default. To disable this, disable the Resizable Window setting. Default Is Native Resolution Enable this option to make the game use the default resolution used on the target machine. This option is not available if the Fullscreen Mode is set to Windowed. Default Screen Width Set the default width of the game screen in pixels. This option is only available if the Fullscreen Mode is set to Windowed. Default Screen Height Set the default height of the game screen in pixels. This option is only available if the Fullscreen Mode is set to Windowed. Mac Retina Support Enable this option to enable support for high DPI (Retina) screens on a Mac. Unity enables this by default. This enhances Projects on a Retina display, but it is somewhat resource-intensive when active. Run In background Enable this option to make the game keep running (rather than pausing) if the app loses focus. This section allows you to customize how the user can customize the screen. For example, here you can set up a startup dialog to allow the user to set their screen resolution from a list of aspect ratios that you provide. You can also determine whether the user can resize the screen and how many instances can run concurrently. Capture Single Screen Enable this option to ensure standalone games in Fullscreen Mode do not darken the secondary monitor in multi-monitor setups. This is not supported on Mac OS X. Display Resolution Dialog See Customizing your Resolution Dialog for details. Use Player Log Enable this option to write a log file with debugging information. Defaults to enabled. Warning: If you plan to submit your application to the Mac App Store, leave this option disabled. For more information, see Publishing to the Mac App Store. Resizable Window Enable this option to allow the user to resize the standalone player window. Note: If you disable this option, your application can’t use the Windowed Fullscreen Mode. Visible in Background Enable this option to show the application in the background if Windowed Fullscreen Mode is used (in Windows). Allow Fullscreen Switch Enable this option to allow default OS full-screen key presses to toggle between full-screen and windowed modes. Force Single Instance Enable this option to restrict standalone players to a single concurrent running instance. 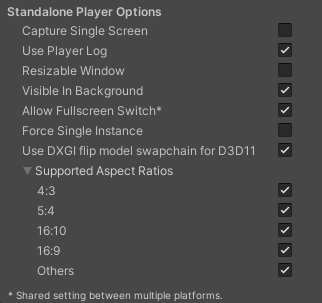 Supported Aspect Ratios Enable each aspect ratio that you want to appear in the Resolution Dialog at startup (as long as they are supported by the user’s monitor). If you want to let the user choose the screen resolution to run the game in, you can create a dialog window that appears when your game launches. Disabled Don’t show the dialog at startup. Enabled Display a dialog asking the user to choose the screen resolution at startup. Hidden by Default Display a dialog asking the user to choose the screen resolution only if the user holds down the Alt key at startup. In addition, you can add a custom banner image to display on the dialog window. Expand the Splash Image section and set a reference to the image you want to use in the Application Config Dialog Banner property. The maximum image size is 432 x 163 pixels. The image does not scale up to fit the screen selector: Unity centers and crops it automatically. Above the common Splash Screen settings, the Player Settings settings allow you to specify splash images for standalone platforms. Application Config Dialog Banner Select a custom splash image to appear on the resolution startup dialog window. For more information, see Creating a Resolution Dialog on Startup. Virtual Reality Splash Image Select a custom splash image to be displayed in Virtual Reality displays. 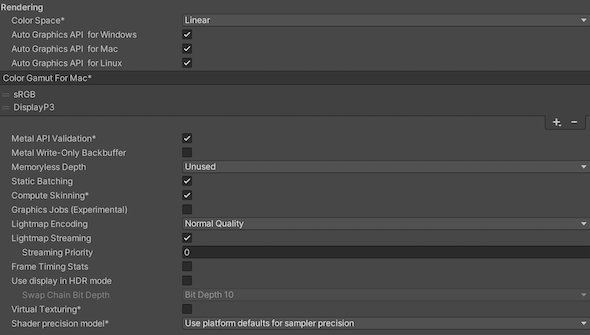 Use these settings to customize how Unity renders your game for Standalone platforms. Auto Graphics API for Windows Enable this option to use the best Graphics API on the Windows machine the game is running on. Disable it to add and remove supported Graphics APIs. Auto Graphics API for Mac Enable this option to use the best Graphics API on the Mac the game is running on. Disable it to add and remove supported Graphics APIs. Auto Graphics API for Linux Enable this option to use the best Graphics API on the Linux machine it runs on. Disable it to add and remove supported Graphics APIs. Color Gamut for Mac You can add or remove color gamuts for the Standalone Mac platforms to use for rendering. Click the plus (+) icon to see a list of available gamuts. A color gamut defines a possible range of colors available for a given device (such as a monitor or screen). The sRGB gamut is the default (and required) gamut. Metal Editor Support Enable this option to use the Metal API in the Unity Editor and unlock faster Shader iteration for targeting the Metal API. GPU Skinning Enable this option to enable DX11/ES3 GPU skinning. Note: This feature is experimental. It may not deliver a performance improvement for your project, and may introduce new crashes. Lightmap Encoding Choose Normal Quality or High Quality to set the lightmap encoding. This setting affects the encoding scheme and compression format of the lightmaps. Enable the SRGB Write Mode option to allow Graphics.SetSRGBWrite() on Vulkan renderer to toggle the sRGB write mode during the frame. Note: Enabling this feature may reduce performance, especially for tiled GPUs. For details on setting these options, see Delivering your application to the Mac App Store. The Use Player Log property enables writing a log file with debugging information. This is useful for investigating problems with your game. However you need to disable this when publishing games for Apple’s Mac App Store, as Apple may reject your submission if it is enabled. See the Unity Manual Log Files page for further information about log files. The Use Mac App Store Validation property enables receipt validation for the Mac App Store. If enabled, your game only runs when it contains a valid receipt from the Mac App Store. Use this when submitting games to Apple for publishing on the App Store. This prevents people from running the game on a different computer to the one it was purchased on. Note that this feature does not implement any strong copy protection. In particular, any potential crack against one Unity game would work against any other Unity content. For this reason, it is recommended that you implement your own receipt validation code on top of this, using Unity’s plugin feature. However, since Apple requires plugin validation to initially happen before showing the screen setup dialog, you should still enable this property to avoid Apple rejecting your submission. Scripting Runtime Version Choose which .NET implementation to use in your project. For more details about .NET Runtimes, see Microsoft’s .NET documentation. .NET 4.x Equivalent A .NET runtime that implements the .NET 4 API. This API is newer than .NET 3.5, and as such, it offers access to more APIs, is compatible with more external libraries, and supports C# 6. This is the default scripting runtime. Scripting Backend Choose the scripting backend you want to use. The scripting backend determines how Unity compiles and executes C# code in your Project. Mono Compiles C# code into .NET Common Intermediate Language (CIL) and executes that CIL using a Common Language Runtime. See the Mono Project website for more information. IL2CPP Compiles C# code into CIL, converts the CIL to C++ and then compiles that C++ into native machine code, which executes directly at run time. See IL2CPP for more information. .Net 2.0 .Net 2.0 libraries. Maximum .net compatibility, biggest file sizes. Part of the deprecated .NET 3.5 runtime. .Net 4.x Compatible with the .NET Framework 4 (which includes everything in the .NET Standard 2.0 profile as well as additional APIs). Choose this option when usng libraries that access APIs not included in .NET Standard 2.0. Produces larger builds and any additional APIs available are not necessarily supported on all platforms. See Referencing additional class library assemblies for more information. C++ Compiler Configuration Choose the C++ compiler configuration used when compiling IL2CPP generated code. Note: This property is disabled unless Scripting Backend is set to IL2CPP. Input System (Preview) Use the newer Input system. The Input System is under development. To try an early preview of the Input System, install the InputSystem package. If you select the Input System (Preview) option without having that package installed, nothing happens except for some extra processing. Strip Engine Code (IL2CPP only) Specify whether the Unity Linker tool removes code for Unity Engine features that your Project does not use. Managed Stripping Level Defines how aggressively Unity strips unused managed (C#) code. Normal Remove unreachable managed code to reduce build size and Mono/IL2CPP build times. Aggressive (Experimental) Remove code more aggressively than under the Normal option. Code size is further reduced, but this additional reduction may have side effects. For example, some methods may no longer be visible in the debugger and code accessed through reflection can be stripped. You can create a custom link.xml file to preserve specific classes and methods. See Managed bytecode stripping with IL2CPP for more information. Enable Internal profiler (Deprecated) Enable this option to get the profiler data from your device in the Android SDK’s adblogcat output while testing your projects. This is only available in development builds. Vertex Compression Set vertex compression per channel. For example, you can enable compression for everything except positions and lightmap UVs. Whole Mesh compression set per imported object overrides where vertex compression is set on objects. Everything else obeys these vertex compression settings. Multi Pass This is the normal rendering mode. Unity renders the Scene twice: first to render the left-eye image; and then again for the right-eye image. Single Pass Render both eye images at the same time into one packed Render Texture. This means that the whole Scene is only rendered once, which significantly reduces CPU processing time. Single Pass Instanced (Preview) The GPU performs a single render pass, replacing each draw call with an instanced draw call. This heavily decreases CPU use, and slightly decreases GPU use, due to the cache coherency between the two draw calls. Using this mode significantly reduces the power consumption of your application. 360 Stereo Capture Enable this option to use 360 capture-enabled shader variants. By default, this option is disabled and Unity does not generate these shader variants.